Trying to describe the magic of San Francisco is impossible, as her features and flavors are endless and ever changing. We encountered this same conundrum when attempting to showcase New York; some places are simply beyond description. To keep the locals happy, however, we’ll do a quick fly-over before moving on. From the Golden Gate Bridge to Alcatraz, Fisherman’s Wharf to serpentine Lombard Street, Haight-Ashbury to Angel Island, Pacific Heights to Chinatown, The Cliff House to Coit Tower, The Palace of Fine Arts to the Presidio, whether you’re ice skating in Union Square, picnicking by the Windmills in the park, or sipping an Irish coffee at the Buena Vista, it’s impossible to be bored in this town. And it does feel like a town, with its many cozy neighborhoods and friendly residents. But how did this wind swept port on the farthest fringe of civilization mushroom into a metropolis? The foundations of San Francisco are pure gold, as they stem from the gold rush of 1849. Carpenter James Marshall was building a water-powered sawmill for John Sutter when he spotted flakes of gold in the American River. The rest is history. People stormed in by land and sea, and the population swelled from 1,000 to 100,000 almost overnight. Flush with gold fever, they arrived from Hawaii, Chile, Peru, China, and parts unknown. In less than five years $2 billion in precious metals had been extracted. 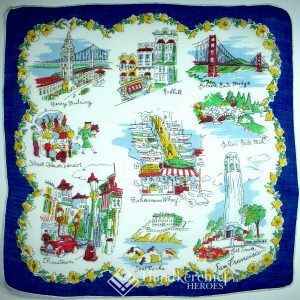 This cheerful hankie is a compilation of history old and new from sparkling Lake Tahoe to vineyards in Napa Valley, from skiing in the Sierras to golfing in Pebble Beach. Holding court dead center are three brown-shirted men panning for gold at Sutter’s Mill. Also note the harbor seals nattily attired in scarves to keep warm! Our trio of stalwart prospectors continue to labor at the mill, while praying their lucre won’t be stolen off the stagecoach. Others sent gold home via cargo ships thinking it safer, but many a galleon sank in the sea (thus spawning further treasure hunting). Meanwhile the city grew – complete with dancehall girls, while others turned to cattle and oil to make their fortunes. These high kicking ladies hearken back to a hankie featured in Hollywood Stars from the 1936 movie “San Francisco.” In the story, Barbary Coast saloonkeeper Blackie Norton (Clark Gable) hires singer Mary Blake (Jeanette MacDonald) to sing in his establishment and quickly falls in love with her. When Blake forsakes the saloon for the Tivoli Opera House, Blackie is bereft. His childhood pal Father Tim (Spencer Tracy) tries to reconcile them to no avail. 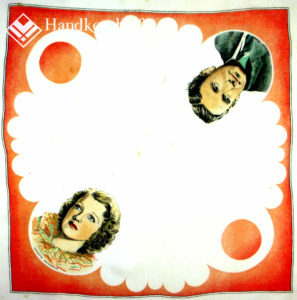 This handkerchief features Tracy and MacDonald from the film. 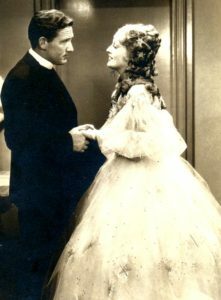 The movie was set against the backdrop of the 1906 earthquake, and indeed Californians have always been survivors of one calamity or another. 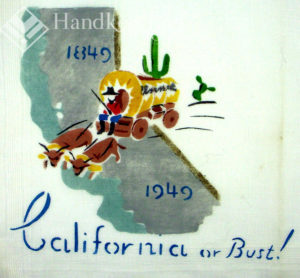 Long before the quake, intrepid pioneers braved both scorching deserts and freezing mountain ranges to seek their fortune in the golden state. 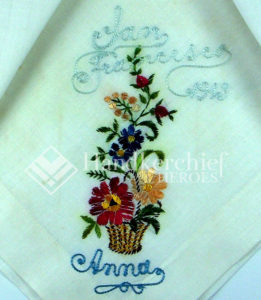 Their tenacity is celebrated in these centennial hankies. Love the crisp graphics. Yes, someone handwrote “Annie” on the covered wagon, so I had to have it! 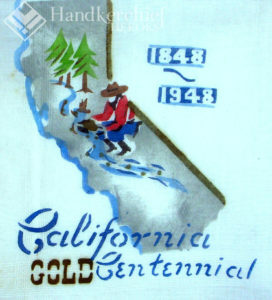 Note instead of a “golden” centennial, for California it’s just plain “Gold.” Fitting for the state’s heritage. 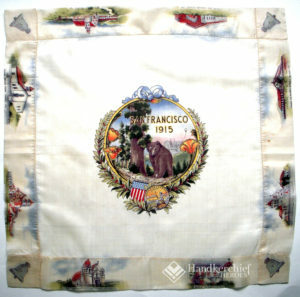 Speaking of celebrations, 1915 was a banner year for the city when it hosted the Pan-Pacific International Exposition. 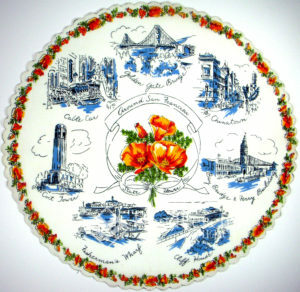 The fair not only celebrated the opening of the Panama Canal, it proved to the world San Francisco was back on top, having survived the devastating 1906 earthquake and fire. When President Taft broke ground for the building of the fair, he touted San Francisco as “The City that Knows How”. 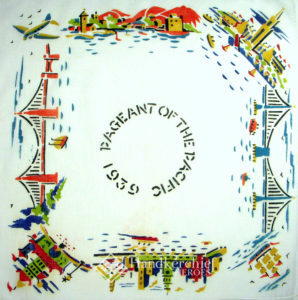 San Francisco hosted a second World’s Fair, The International Exposition in 1939 to celebrate the completion of the Oakland Bay Bridge and the Golden Gate Bridge at this Gateway to the Pacific. 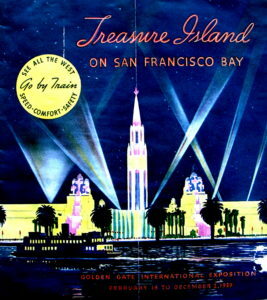 They created Treasure Island – an artificial 400 acre island in the middle of the bay between the two bridges. 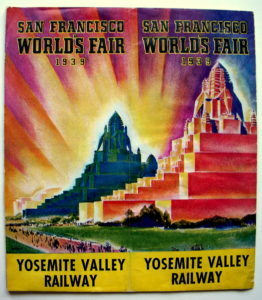 The entrance to the fair featured twin Elephant Towers flanking a gigantic Tower of the Sun, which served as a backdrop for an eighty foot tall statue of the Goddess Pacifica, symbolizing peaceful trade between east and west. Millions came by air, sea and land to visit the spectacle. 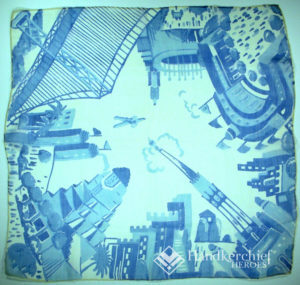 In this handkerchief’s rendering of The Fair note the Pan Am China Clipper resting in the water in the southeast corner. This “flying boat” was used to inaugurate airmail delivery between San Francisco and Manila in 1935, and was revolutionary for its time. 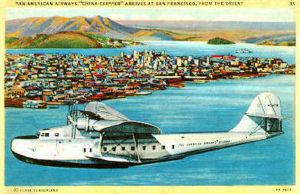 There was even a 1936 movie “China Clipper” starring Pat O’Brien and Humphrey Bogart. 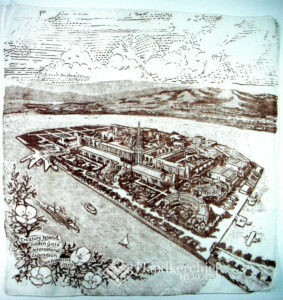 Plans for the island to become an airport were scrapped by the onset of WWII. 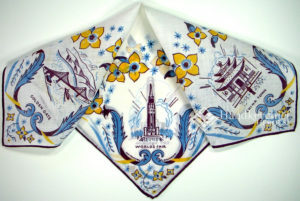 Many souvenir handkerchiefs literally represent pages in the city’s history. Everything comes together in this rosy beauty – the Elephant Towers, the Tower of the Sun, and flight. 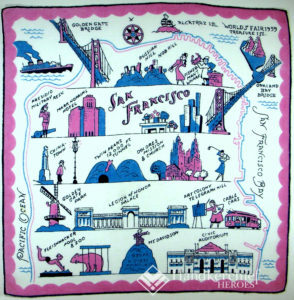 “No city invites the heart to come to life as San Francisco does. 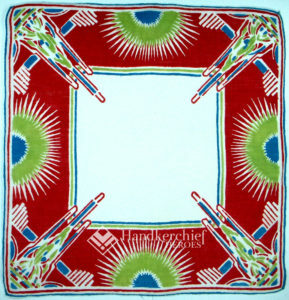 The zip, zap and zing of firecracker hues and art deco graphics give this hankie punch and pizzazz. 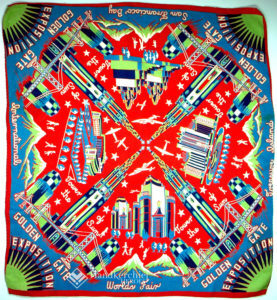 A softer rendition is equally enchanting when conveying the scope of the fair and its breathtaking bridges. 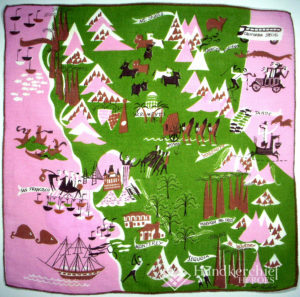 Printed on gossamer thin silk chiffon, it’s strictly for fashion. Images ran the gamut from art deco minimalist to realistic renditions with floral borders. There was something for every style and taste. East meets west in this celebration of new airline flights to the pacific. 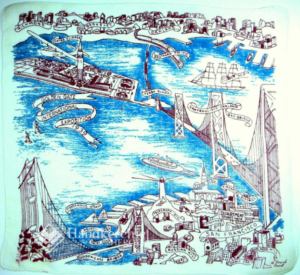 The mermaid in the lower right corner welcomes “The Asiatic visitors to the International Exposition on San Francisco Bay. 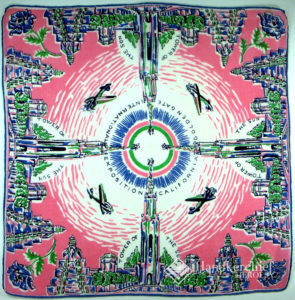 I Magnin & Co.” Founded in San Francisco in 1876, I Magnin & Co. was a high fashion luxury emporium which reigned supreme for over a century. Visitors to the Fair would certainly make a stop at this establishment. 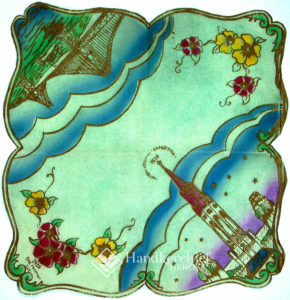 This hankie appears to be a customized gift for Asian guests. 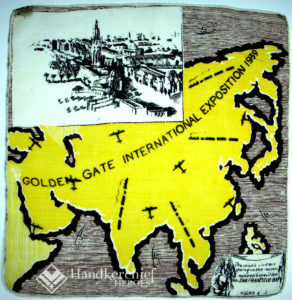 When it came to souvenir maps, many showcased the wondrous bridges and the International Exposition at Treasure Island. 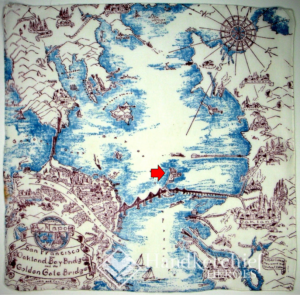 In other renditions, the Fair is merely a spec on the landscape of the magnificent bay. Just as we saw in our Hollywood hankies, the attention to detail in the hand drawn renditions is impressive, and frankly, great fun. These would be popular favorites for today’s coloring book fans! 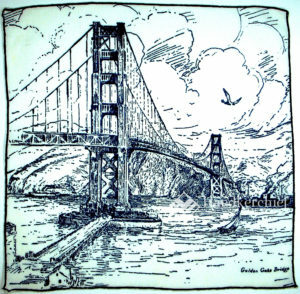 Often artists focused on one particular landmark, like this terrific rendition of the Golden Gate Bridge. 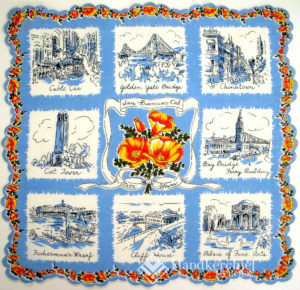 Many tourists favored compilation hankies featuring the “best of” the tourist attractions.” It’s fun to peruse the variety of renditions; surely one will resonate with your style. 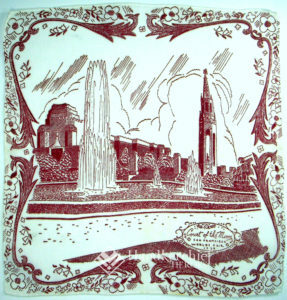 Note both bridges are featured, as well as the twin elephant towers at the entrance to the 1939 Exposition. That’s one giant crab for sale at Fisherman’s Wharf! Note the lady thinking of purchasing it wears both a hat and gloves. Can you doubt there’s a hankie in her handbag? Love the sophisticated minimalist graphics of this silkscreened beauty. In contrast, the renderings below remind me of newspaper illustrations. Their clever circular placement around a cable car climbing uphill force your eye to travel around until you feel as though you’ve circled the bay! Orderly as a tourist guide, the grid of top attractions on the left, bordered by brilliant California “gold” poppies, assures that you won’t miss a marvel. Alongside we find the same attractions in the round. 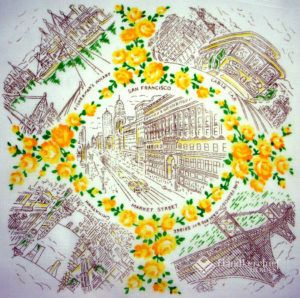 Circular handkerchiefs were popular as a novelty fashion accessory. 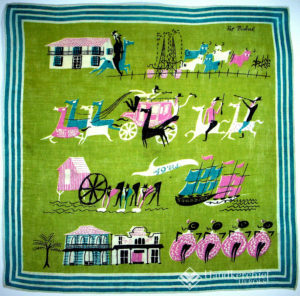 One need look no further than the style of the autos on this hankie to ascertain it’s vintage. 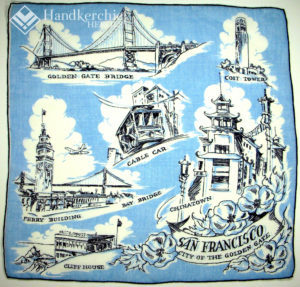 Perhaps a nature lover designed this hankie as s/he’s included Golden Gate Park and the charming flower stalls that dotted the city until the early 1980’s. 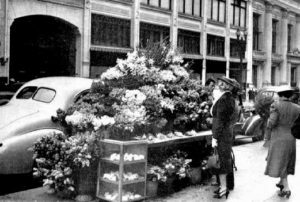 Certain stalls were sacrosanct (in front of Gumps, alongside I. Magnin) where a gent could always count on finding a gardenia for his lady. Note the lantern streetlights in Chinatown. 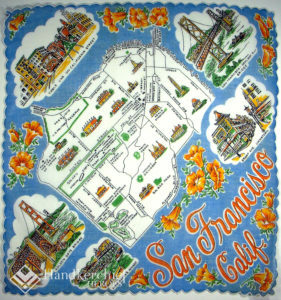 We’ll revisit those in San Francisco II. 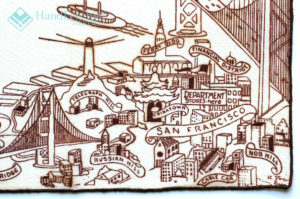 for others, it’s a commanding landmark like Coit Tower or the Ferry Building. 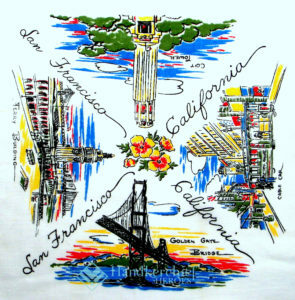 The choices are endless, but we’d better wrap up, so let’s send you off with a vintage version of Google maps – this charming scalloped number should help you navigate the city sites. “It’s an odd thing, but anyone who disappears is said to be seen in San Francisco. The magical light, the glittering hills, the moan of foghrons in the mist, all provide a rich backdrop for the movies, from romance to film noir. For over 80 years, dozens of films have been shot in the bay area. 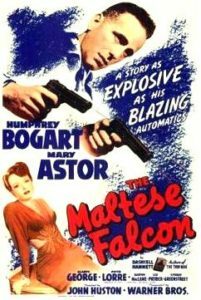 We’ve listed a several below, but one favorite always cited, and credited for being the first major film noir, is the 1941 classic “The Maltese Falcon” starring Humphrey Bogart as private detective Sam Spade, with Mary Astor, Peter Lorre, Sydney Greenstreet and Gladys George rounding out the cast. 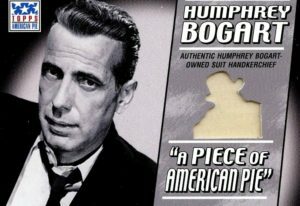 Many of these hankies hail from that era, and you can purportedly even buy an actual Bogart owned handkerchief! Hmmmmmm. I wonder if these were as plentiful in their day as baseballs signed by Babe Ruth…. The U.S. Navy originally planned to paint the Golden Gate Bridge black with yellow stripes. Yikes! 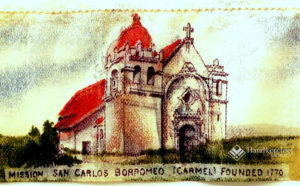 The final “International Orange” color was originally supposed to be a sealant. Our friend, Bonnie Huelsman, sent me this delightful article. You are a very interesting and fascinating person, Ann. You have hit on something with your coloring book remark. It would be great fun to trace these for a square coloring book. 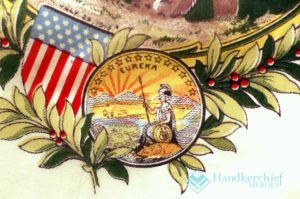 The inside cover pages could have small color photos of the original hankies. Black and yellow for the GG Bridge? The Bumblebee Bridge! I DO LOVE bumblebees, but not for a Bridge.